Morning campers! It might be early but I’ve got something to encourage you out from the bottom of that coffee mug… look lively, it’s giveaway time! Boots 17 have been setting lashes a-fluttering across the country with the release of their latest mascara, forget big hair… we want bigger lashes. SIX lucky winners will each receive a tube of the NEW 17 Blow Out Mascara (£6.29) which promises up to 12x volume thanks to an oversized brush and a thickening, argan oil-enriched formula. Sound good? Enter via the widget below to throw your name into the virtual hat – good luck ladies! 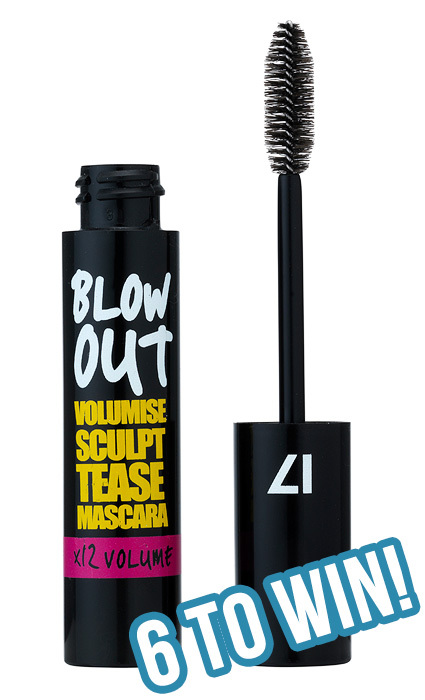 03: There are six prizes to be won, each comprising of a tube of 17’s NEW Blow Out Mascara (worth £6.29) varieties will be chosen at random and specific product requests cannot be accomodated. No cash alternatives. 06: Only one entry per email address will be accepted. 07: Personal details will not be kept or forwarded and are only used in the context of this competition to inform the winner(s) of their prize status. 08: Six winners will be selected at random from all entries received. 09: Winners will be notified within 5 working days and will be expected to reply to an email sent to the address used to enter the competition within 5 working days or risk forfeiting the prize. i’m a major mascara fanatic! i dont have the time or patience to fiddle with false lashes, so instead i just buy mascaras that claim to give you colossal lashes and put a few more coats on for good measure! would love to give this a whirl! I’d love to give this a go I’m due a new mascara and can’t decide which one to buy! WOW, I LOVE mascara and am always searching for the next best mascara ever created. This one really caught my eye. I would absolutely love to have the opportunity to try this mascara and see if it’s as fabulous as it sounds. Thank you for the chance to win such a generous prize, for loving your fans as much as we love you and good luck to all.